Trump supporters, however, waited even longer here in Fort Dodge to hear from the man that they consider the right choice for president. Many of them were thrilled. Others were merely spectators, coming to see what the noise was all about. Part of the reason for the long delays is the additional time required by the Secret Service, now tasked with securing Trump events. Agents ran everyone through a metal detector and checked all bags. But the buzz of anticipation was already filling the Iowa Central Community College campus by 3:00 p.m, where members of the media were told to check in if they wanted to make the 6:00 p.m. speech. The campaign organizer described for the volunteers just exactly what they were about to witness in the arena. “Events are where you get the belief, right? That’s why you’re here today, your belief in the whole campaign – it will be really – it’ll just be like ::explosion sound:: huge, because you’re going to see the guts, you’re going to see the brain, you’re going to see him just so fired up, you’re going to see his passion you’re going to be able to feel the energy right?” he said. The volunteers nodded eagerly, holding piles of campaign materials and awaiting the appearance of the man, that up until now, most had only seen on their television screens. The lines were already overflowing when the doors opened for the public at 4:00 p.m. Due to security screening, it took more than an hour for the audience to trickle in. The auditorium held some 1,500 people. Those who didn’t fit were directed to an overflow room in the gym, to watch on TV screens. Supporters quickly discovered that if they went out of the auditorium to the adjoining bathroom, they would have to get back in line to get screened again by the Secret Service. Most decided to wait it out. 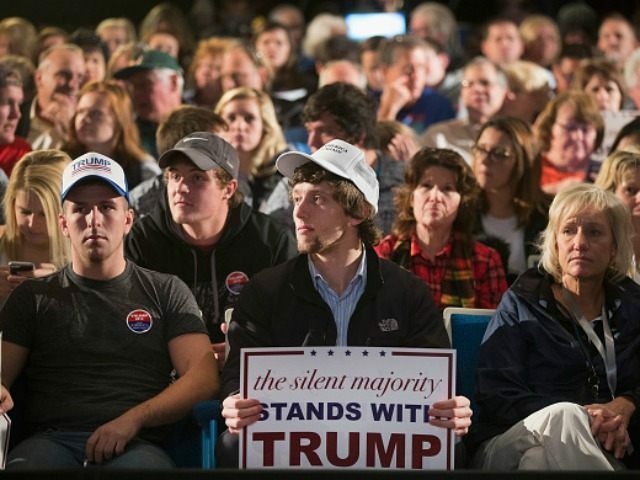 While they waited for the main event, supporters were happy to speak to Breitbart News and express their feelings about Trump as the soundtrack featuring songs from Journey, Aerosmith, and Adele pumped into the auditorium. Lee Booton, 71, a veteran, explained he has spent much of his life organizing veterans for multiple Republican campaigns in Iowa. His earliest political memories include putting up flags for Dwight Eisenhower’s campaign as a kid. He refers proudly to photographs he has with former President George W. Bush and even Jack Kemp, when he supported his unsuccessful presidential run in 1988. Booton indicated that he enjoyed Trump because he never holds back in his campaign appearances. “I think so many things are going wrong, we don’t have to be politically correct,” he said. “It’s gotta change, the whole policy. I don’t care if he has to fire everybody in the veterans administration,” he said. He also supported Trump on foreign policy, even though the billionaire is sometime light on specifics. As a Vietnam veteran, Booton emphasized the importance of winning if sending troops to fight overseas. “I believe in what he’s saying. If we do get involved overseas, we go in to win,” he said. He also believed Trump was the right leader to destroy ISIS. “I think he would. I think he wouldn’t even dink around with it,” he said. A pair of African-American students were eager to talk about Trump, explaining why they supported him. Mariel Slaughter said he liked that Trump was “a businessman and knows how to get the job done.” He grew up in Chicago, he explained, initially believing that all Republicans were bad, but gradually shifted his political affiliation as he grew up. He has a reputation on campus for speaking his mind on politics. Slaughter is currently at Iowa Central Community College on a scholarship studying to become a chemical engineer. Fellow student Marque Pearce agreed. “We feel that Trump has a great plan. We feel like he’s somebody who can say what he needs to say. He gets his point across, and he doesn’t beat around the bush,” he said. Pearce, who up in Wisconsin, explained that he got involved in the 2008 and 2012 Obama campaigns, but that he was not a fan of Hillary Clinton. People who were angry with Trump, he explained, were merely misled by the media. Candidates like Hillary Clinton, Bernie Sanders, and Martin O’Malley, he explained, were just trying to win votes by promising free college. A group of college girls in the audience admitted that they were Trump supporters, but only agreed to speak anonymously as a group. “He’s not the typical political candidate, you know. He speaks his mind … he’s like everyone in our generation; we speak our mind,” another girl explained. They dismissed the accusations from critics who said he was racist. “Trump is funny. He just says what he wants. I think that’s what we need, someone that’s not afraid to say how they actually feel,” one girl said. One girl who was with the group, a Canadian, explained that she was only there as a spectator. “I see way too many internet memes and posts to have a valid opinion,” she said. Two other college-aged men in the student section also talked about why they liked Trump. “Donald definitely just says it like it is. It’s a good thing and a bad thing, I’d say, but I appreciate that,” student Andrew Stover explained. Student Seth Heinole agreed, explaining why Donald Trump was his first choice for president. “Trump is more bold, outspoken, and loud. I like how he is funding his own campaign. He can’t be bought by corporations,” he said. He also liked Dr. Ben Carson as his second choice. Mary Gonnerman, a Trump supporter who has two kids in college, also preferred his tough demeanor. She admitted that she hadn’t been too involved with politics in the past, but believed that Trump understood what was necessary to fix the country. Choosing to fund his own campaign, she explained, was another reason she liked him. “He doesn’t have anybody in his pockets that he has to please,” she said. “You actually listen to him a few times, and he actually knows what he’s talking about. With all of his history with his business, he actually knows what he’s doing,” he said confidently. Trump’s demeanor was refreshing, he explained. “I choose Trump because he’s not another politician, and he’s not just going to say stuff just to get the votes. He’s not going to say the popular opinion, he’s not afraid to say something that’s unpopular,” he said. He also liked how Trump was media savvy, particularly on social media. “He stands out, especially to us younger people on social media. 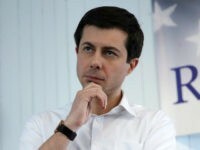 He’s not just a typical politician going to coffee and lunches,” he said. Another supporter, Max Breham, was sporting a “Make America Great Again” hat and a “Cats For Trump” supporter button. His support for the candidate was clear judging by his apparel as he attended the rally with his grandparents. Dwayne Olsen, who served in the military in 1972, had been standing in line since 2:45 p.m. He said that although he had been a life-long Democrat, he was beginning to reconsider his allegiance and had been watching the Republican debates on TV. He appreciated that Trump promised to the get the best people available to help run the country. “If he doesn’t have the right skills, he’s going to make sure he has people underneath him who will help advise him. I really believe that,” he said. He noted that Trump had completely taken over the political conversation and filled the airwaves. Because of that, he admitted, he hadn’t heard much from Hillary Clinton at all. “Everything is Trump now, you know?” he said.